Lieu - Lieu - Lieu! Plages! Plages Plages !!! Piscine privée chauffée et flambant neuve construite en 2018. 52 pouces d’écran plat haute définition avec PlayStation 3, Play Station 2 et Netflix! Cette maison est située 8 pâtés de maisons de la plage. Situé dans le quartier haut de gamme exclusive de la Cove - 2 miles de la célèbre Boca Raton Hôtel and Resort. Il est à quelques minutes de la plage principale. 3 chambres (toutes avec des draps de qualité supérieure), 2 salles de bains contemporaines magnifiquement mises à jour, superbe espace de divertissements avec des patios surdimensionnés, inoxydable barbecue, la palmeraie de l'aménagement paysager, grande 52 "TV à écran plat, avec Netflix, lecteur DVD, super câble rapide modem WIFI, Internet par câble & 32 'TV écran plat dans la chambre principale, Espresso / Cappuccino machine, entièrement équipée Gîte Facility, Central climatisation et le chauffage. Nous sommes heureux d'offrir à nos clients une cuisine entièrement équipée qui comprend un éventail de cuisine et de ménage fournitures de base. Lieu - Lieu - Lieu !!! Étapes de la plage :: Cette maison est situé à 8 pâtés de maisons de la plage. Ce est une maison de style Key West et situé dans le quartier chic exclusive de la Cove - 2 miles de la célèbre Boca Raton Hotel and Resort. Il est à 5 minutes de la plage principale, à 30 minutes de Ft. Lauderdale Convention Center, Ft. Downtown Lauderdale et à proximité de toutes les commodités que vous pouvez imaginer des centres commerciaux, aéroports, hôpitaux, tous les grands magasins de détail, Boca Raton Town Center Mall, Boca Raton Mizner Mall, Sawgrass Mills Mall, Sports nautiques, centres de fitness, spas, pêche, kayak, Para-voile, plongée en apnée, plongée sous-marine, Bahia Mar, Restaurants - you name it! Grands téléviseurs à écran plat, lecteur DVD, système de divertissement Sony Blue Ray Play Station 3, films Netflix illimités, télévision par câble Internet avec WIFI. Attractions de la région :: Dans les environs, et pas plus d'une heure - on peut visiter la suivante: Miami - avec le super célèbre Miami South Beach et Deco Drive, célèbre Las Olas Boulevard, Worth Avenue à Palm Beach, Key Biscayne, Coconut Grove, Coral Gables, Ft. Lauderdale, Palm Beach, Delray Beach, Boca Raton, Palm Beach, West Palm Beach et les meilleurs centres commerciaux tels que Town Center Mall, Aventura Mall, Sawgrass Mills Mall, Galleria Mall, Palm Beach Gardens Mall et beaucoup plus. Il ya une belle nouvelle piscine communautaire, qui est chauffée, quatre blocs de la maison avec une entrée de la plage et nager voies. Les photos sont disponibles sur demande. The house was exactly as advertised and well appointed. Spices, oils and condiments for cooking. Every utensil, pot or pan you could need. Pool and backyard are gorgeous, and all the beach chairs and umbrella for the ocean visits. When there was a glitch with the dishwasher a new one was installed within a few hours. Definitely a worry free stay with a super host. Very clean and spacious home that has everything you need. Well decorated with two very large flat screen TVs. Karina is very responsive to questions etc. The pool in back is a great way to relax & chill after a day at the beach. Some traffic at times due to a bridge that is closed for repairs on the Inter-Coastal Waterway. Ideal place for a family with 2-4 kids.. This house was/is perfect. You can tell every last detail has been thought of to make sure your stay is more enjoyable. I brought my 18 month old and 3 year old and it was the perfect family getaway. Did I mention the beach is a short 3 minute drive and the salt water pool is amazing. Will be recommending this house and hope to be able to stay again in the future. Wow! Thank you so much for your high recommendation, and thank you for pointing out some of our best qualities. Our goal is to surpass all expectations, especially cleanliness. We are so happy you and your family are happy with our vacation getaway. Of course we would love to have all of you stay with us again. Hope to see you again next year. Very beautiful home. Great for families. My girlfriends and I booked this home for a winter getaway from the New York City cold. The home we arrived at was perfect! The design is done with class and quality. Everything was exceptionally clean. It was equipped with everything we could think we might need- coffee makers, hair irons, books, plenty of towels, pool and beach equipment etc..
Karina was so easy to deal with and so responsive. Any questions we had she replied to right away and any issues we had she resolved in a timely and generous manner. Would definitely come back! Thank you for a great vacation. Thank all of you for your very nice compliments. You are so nice. We would love to have you stay with us again. Our most important goal is ultra cleanliness. I am so glad that we met all of your needs. Hope to see you next year. This was our 3rd year renting Karina and Wayne's property and it keeps getting better and better! 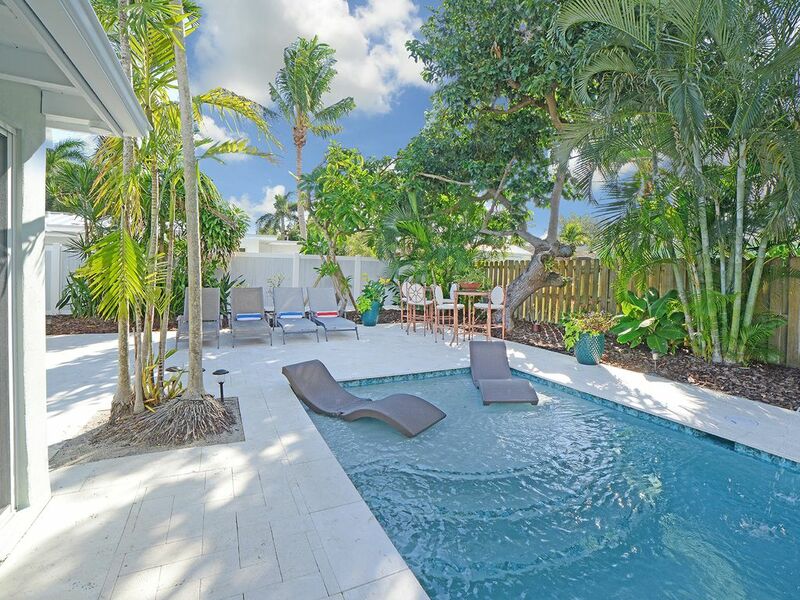 They took a beautiful home, just minutes from Deerfield Beach and found a way to make it even better - they added a luxurious, heated pool with spa. This is not the type of pool you'd necessarily found in other rental homes - the is first class, top of the line in every way. The landscape surrounding it is outstanding. Karina and Wayne have created a really relaxing backyard oasis. This property is first-class in every way. Things that matter to us: comfortable beds, functional kitchen, pool (of course), excellent Internet, good washer and dryer, among other things. Their property checks all of the boxes. Thank you to our always wonderful hosts - they are receptive to our every need - not that we have many because they have thought of pretty much everything. WOW! Thank you so much for taking the time to tell us, and all future guests, the many positive elements of our vacation rental home. As you said, we have built this fully resort-style heated pool, spa and sun deck. All of this was designed by my famous HGTV Architect husband and I, as were all the new interior design elements that you noticed. With all of that great design, our most important point that we want to be known for, is our absolute cleanliness. We thank you for your many kind words and compliments, and we look forward to see you again next holiday season. We love your family. Il est à quelques minutes de la plage principale, à 30 minutes de Ft Lauderdale Convention Center, Ft Lauderdale centre-ville et à proximité de toutes les commodités que vous pouvez imaginer des centres commerciaux, aéroports, hôpitaux, tous les grands magasins de détail, Boca Raton Town Center Mall, Boca Raton Mizner Mall, Sawgrass Mills Mall, sports nautiques, centres de fitness, spas, pêche, kayak, voile Para-, plongée en apnée, plongée sous-marine, Bahia Mar, Restaurants - you name it! Dans les environs, et pas plus d'une heure - on peut visiter la suivante: Miami - Miami South Beach, Key Biscayne, Coconut Grove, Coral Gables Ft Lauderdale - Aventura, Aventura Mall, Sawgrass Mills Mall, Galleria Mall, plantation, Weston , Pompano Beach Palm Beach - Deerfield, Delray Beach, Boca Raton, Palm Beach, West Palm Beach. Golf: Il ya au moins 10 - 18 trous de golf dans 10Pompano Beach Municipal, etc. Ski: Il ya des possibilités infinies pour le ski nautique et autres sports nautiques, y compris les motomarines.